In an advance that could open new avenues for solar cells, lasers, metamaterials and more, researchers at the University of Illinois have demonstrated the first optoelectronically active 3-D photonic crystal. 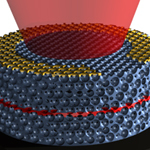 Using an epitaxial approach, researchers developed a 3-D photonic crystal LED, the first such optoelectronic device. “We’ve discovered a way to change the three-dimensional structure of a well-established semiconductor material to enable new optical properties while maintaining its very attractive electrical properties,” said Paul Braun, a professor of materials science and engineering and of chemistry who led the research effort. The team published its advance in the journal Nature Materials. Photonic crystals are materials that can control or manipulate light in unexpected ways thanks to their unique physical structures. Photonic crystals can induce unusual phenomena and affect photon behavior in ways that traditional optical materials and devices can’t. They are popular materials of study for applications in lasers, solar energy, LEDs, metamaterials and more. However, previous attempts at making 3-D photonic crystals have resulted in devices that are only optically active – that is, they can direct light – but not electronically active, so they can’t turn electricity to light or vice versa. The Illinois team’s photonic crystal has both properties. To create a 3-D photonic crystal that is both electronically and optically active, the researchers started with a template of tiny spheres packed together. Then, they deposit gallium arsenide (GaAs), a widely used semiconductor, through the template, filling in the gaps between the spheres. The GaAs grows as a single crystal from the bottom up, a process called epitaxy. Epitaxy is common in industry to create flat, two-dimensional films of single-crystal semiconductors, but Braun’s group developed a way to apply it to an intricate three-dimensional structure. The epitaxial approach eliminates many of the defects introduced by top-down fabrication methods, a popular pathway for creating 3-D photonic structures. Another advantage is the ease of creating layered heterostructures. For example, a quantum well layer could be introduced into the photonic crystal by partially filling the template with GaAs and then briefly switching the vapor stream to another material. Once the template is full, the researchers remove the spheres, leaving a complex, porous 3-D structure of single-crystal semiconductor. Then they coat the entire structure with a very thin layer of a semiconductor with a wider bandgap to improve performance and prevent surface recombination. To test their technique, the group built a 3-D photonic crystal LED – the first such working device. Now, Braun’s group is working to optimize the structure for specific applications. The LED demonstrates that the concept produces functional devices, but by tweaking the structure or using other semiconductor materials, researchers can improve solar collection or target specific wavelengths for metamaterials applications or low-threshold lasers. This entry was posted in Optoelectronics. Bookmark the permalink.